The days following Thanksgiving Day are some of the most important shopping days of the year for businesses. Between Black Friday, Small Business Saturday, and Cyber Monday, companies can make a lot of money depending on how they strategize for each day. While Black Friday has been a major sales day for years now, Cyber Monday has only recently become a serious contender to be the top online retail holiday. In 2017, Cyber Monday generated the largest sales revenue in U.S. history for online shopping, with the number of digital transactions totaling about $16.9 billion, which was a 15 percent increase from 2016. A major reason that online shopping has become more lucrative than shopping in a physical store is that shopping online is more convenient. You can shop using a desktop computer or a mobile device from anywhere. Shoppers also like being able to avoid traffic as well as large shopping crowds. Online businesses need to make sure they’re prepared for the kind of traffic they will receive as people do more internet shopping. It’s vital that the website be optimized for conversions ahead of any big event, like Cyber Monday or Black Friday. Additionally, if you haven’t already, you should make sure that your website is mobile responsive in time for the season so you don’t lose any potential customers. 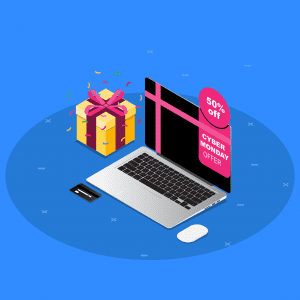 Offer Cyber Monday exclusive deals — For businesses that have both an online and physical store, offering exclusive online-only deals on Cyber Monday is a great tactic. Having a special offer for one day only can encourage customers to come to your site and browse. Emphasize the time crunch — While all online shoppers wish Cyber Monday deals would last forever, these deals will eventually go away. As part of your marketing campaign, emphasize the temporary nature of these deals by including a countdown clock for certain offers. Including this feature will give shoppers a sense of urgency and encourage them to complete their purchases quickly so that they don’t miss out on good deals. Send a Cyber Monday newsletter — If you have a newsletter, send it to your customers to let them know what kind of deals you will be offering on Cyber Monday. This can help your loyal customers know when their favorite product is going on sale. If you provide exclusive deals in your newsletter, you can also increase newsletter signup rates. Promote free trials — For online businesses that offer subscription services, you can get your foot in the door with potential customers by offering free or reduced-price trials on Cyber Monday and some will renew their subscriptions and become an on-going customer. Pay attention to abandoned carts — Abandoned shopping carts are incredibly frustrating for many online businesses. However, you shouldn’t just leave them to molder in the internet ether. Focus a retargeting campaign on customers based on what they have in their cart. If you’re innovative and prepared, Cyber Monday can be a great way to boost online sales and sell out products.